When you’re in a university, no matter what your major is, you’ll be faced with the challenge of producing a thesis project. It isn’t an easy thing to do; in reality, thesis writing is one of the hardest things that students must do, simply because of the complexity and length of it. There’s nothing that compares to it. It’s too demanding and also requires too much time. No other academic paper resembles it, and if you’ve done a project like this before, then you understand what’s at stake. Picking a dissertation topics is not easier; ask anyone who’s been through this. In fact, choosing the right one will define whether your research is a total failure or success. Ph.D students know what it is like to go through this stage. Still, you shouldn’t be stressed out about having to do the writing in your paper, as you can always reach out for help online. A thesis writing service may be just what you’ve been looking for. You can search for people online willing to do the task for you at an affordable price. Consider giving it a try. 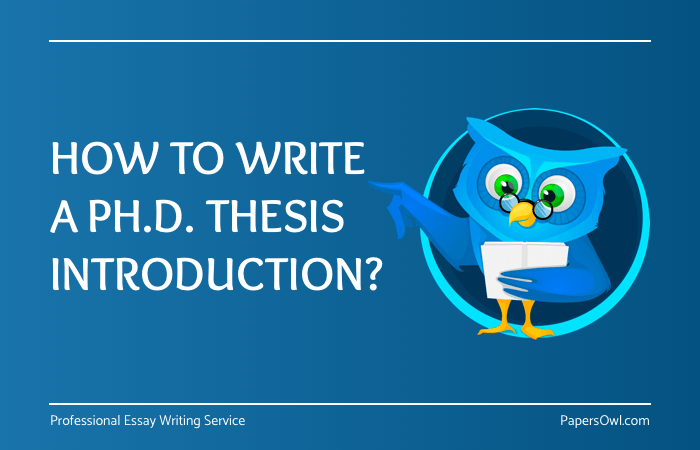 Nonetheless, if you wish to complete your dissertation, there are many aspects that need to be taken into consideration prior to starting to write my Ph.D thesis. Why? Because by applying all the recommendations that’ll be mentioned below, you’ll end up delivering an excellent dissertation which is crucial to receiving your degree! That’s every student’s dream! It’s now your turn to start! What is the introduction like in the thesis? There are many aspects to be considered when commencing such a project. We’ll get to that soon. For instance, the introduction chapter is possibly the most critical part of these types of documents; this doesn’t mean that the actual research isn’t relevant, it just means that with the proper introduction, you will be attracting and appealing to your reader. You will do so by applying three techniques and each technique has sub-tasks, which tell you what to do next, and depending on what you need and want to say in this part, you can use multiple sub-tasks. Don’t worry if you’re confused, we’ll explain everything next. Need help with writing a Ph.D. thesis? 1st technique: Establish your limits and boundaries. Tell the reader what you will be talking about in order for him/her to familiarized with it. Your topic must appeal to others. Avoid boring topics that you believe may only interest you. 2nd Technique: Establish a niche; explain to the reader why your topic should be considered, why he/she should do some research on it, and essentially, why it should interest him/her. 3rd Technique: Introduce your study. State your hypothesis, and don’t forget to attract the reader with relevant questions that’ll be analyzed afterward. Provide a background for your topic. Define the terms and scope of your project; the success of your document depends on that. Keep that in mind at all times. Briefly explain the goals of your work; this is crucial for an excellent introduction paragraph meaning that this section requires this part. Keep in mind, to write an excellent introduction that there are many details that should be included in your introduction. Are you having trouble? Find a reliable writing company to pay for a thesis online and get your degree. Start the paragraph with an intriguing sentence that makes the reader want to keep reading. Prepare an outline prior to writing to be organized when putting it all together. Point out the things that people don’t know about your topic, and why they should. Proofread the final paragraph before moving on, to check for any spelling or grammar-related mistakes.